Move over grown ups, it’s time for the kids to feel the thrill of stand up paddle boarding. 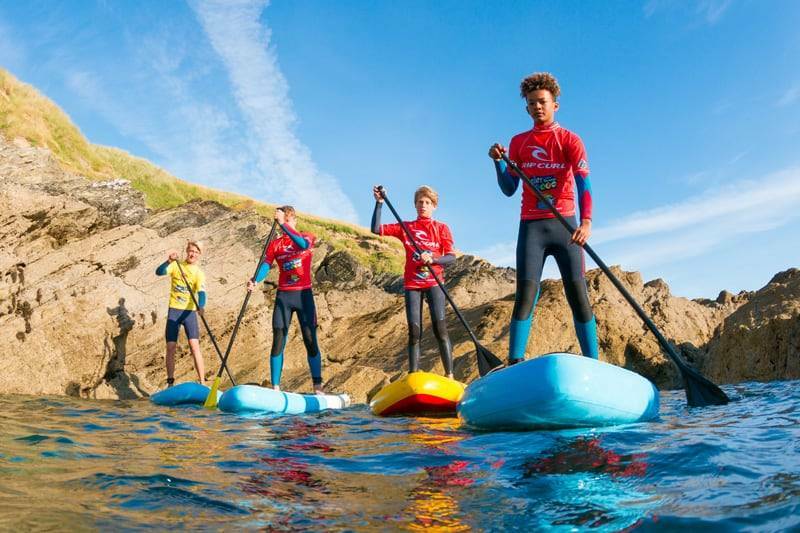 Combining an adrenaline filled exploration of the beautiful Cornish coast with vital water safety knowhow, our SUP lessons for kids are the talk of the playground. Nothing quite beats the first time you try something quite as breath-taking as stand up paddle boarding, it’s a buzz like no other and being big kids ourselves we’re specialists at helping young adventurers take their experience to the max. From the moment our sessions start to the second they end, our lessons for children are 100% safety first. We’ll get everyone kitted out in wetsuits, buoyancy aids and helmets and run through vital beach safety info before perfecting paddle strokes and basic manoeuvres on the shore. Now for the exciting bit. We’ll take to the water and strike out around Newquay’s stunning coastline for an exploration like never before. As we explore hidden coves, craggy inlets and normally inaccessible parts of the coast, tales of smuggling and piracy will abound bringing the area’s history and heritage to life. As our SUP boards glide over a rich underwater world there will also be marine wildlife to look out for, and if we’re lucky, friendly seals to meet. Under the guidance and tuition of some of the most qualified, experienced and insured instructors in the country, adventures with Newquay Activity Centre are all about practical learning and exploring our coastlines up close. With us, children are encouraged to push their boundaries whilst safe in a supportive environment. So drop us a line or give our team a call and we’ll sort you out with the best activity for you. Call 01637 877722, lines open from 8am-10pm.